Hong Kong in 2025 is the setting for this compendium of five short films by different directors that offer a speculative approach to the possible political trajectory that Hong Kong may take in the near future. These often politically controversial vignettes offer diverse socially dystopian examples of courageous activist film-making in a climate that is not encouraging of such expression. It is also a thought-provoking and intriguing cinematic experience. The first film concerns the characters involved in a staged political assassination secretly plotted by members of the ruling party, in order to create mass panic and have and excuse to impose tighter social controls. The second film is a leisurely, melancholic examination of the work of two archivist lovers, collecting specimens of everything they can, as the world dies and crumbles around them. Then one of them decides to make a strange and tragic request. 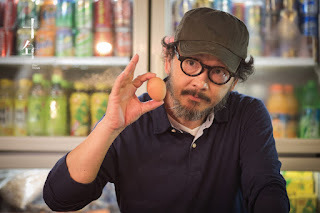 The third short is a portrait of a well-meaning family man and taxi-driver as he becomes increasingly marginalised as the ruling government increasingly impose laws to instigate Mandarin as the major language and outlaw the use of Cantonese which is most prevalently spoken in Hong Kong. The fourth tale is a provocative mystery story concerning the identity of a protester who self-immolates outside the British consulate in HK and the cruel suppression of student activists by government forces. The outspoken students also face hostility from fearful or loyal locals who are frightened that a growing movement of civil disobedience will create an upheaval in the status quo and cause violent retribution to follow in its wake. The unravelling of the mystery provides a surprising and affecting denouement. The last and my personal favourite of the five cinematic vignettes is an affecting allegory called ‘Egg’. It features a wise and kindly Hong Kong shopkeeper who is sad to see his supply of local eggs dwindling as local produce is increasingly outlawed. He pays a sentimental visit to his last supplier, who is being forced to close his chicken farm and relocate abroad. The shopkeeper’s son is compelled to belong to a group of para-military child informers (akin to the Red Guards of China’s 1960s Revolution) and to work covertly for the Chinese government. His father questions the secrecy under which these child informers have to operate and openly encourages his son and his young fellow informers to think for themselves rather than being blindly obedient to the commands of their shady overlords. His own son however, has a surprise in store for his concerned father. Ten Years opened on just one cinema screen in Hong Kong but word-of-mouth made it a box office success. It was entered into the prestigious Hong Kong Film Awards, where despite its controversial political content, it surprised many by picking up the Best Film prize. Coming to BFI London Film Festival on 6th and 7th of October you can book tickets here.